A new, modern base design for our award-winning Original Rollercoaster brings a new twist to this classic toy! 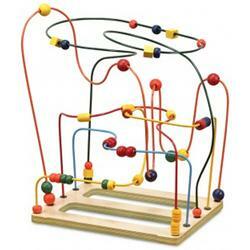 Kids cant keep their hands off this exciting, stimulating, and fascinating toy. It is a favorite of pediatricians, teachers, and parents, and has been acclaimed as the most fun, educational toy in todays market. The Rollercoaster is a three-dimensional manipulative experience in the perceptual, motor, and language areas. Developmental and learning skills are "challenged" through fun play. A Best-Seller and must have.